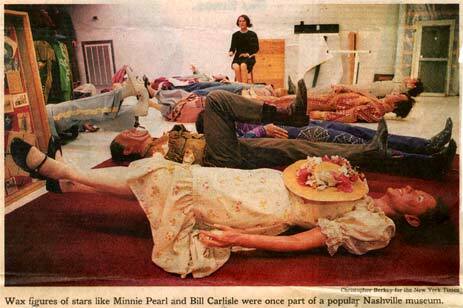 NASHVILLE -- Where do wax figures go when they die? Williams, George Jones and Dolly Parton. Cash donated clothes and instruments and even tended to their characters. on his exhibit, employees saw she had put a picture of herself on the mantel. a traffic circle, offices and a Ritz-Carlton hotel. their vintage finery and original instruments? set, and we already had many of the same figures." that the figures had been melted down. tradition while paving over its past. the owner of Hat Country, a wax museum neighbor that is going out of business. borrowing their boots to wear around town. microbiology studies at Vanderbilt University to open the restaurant. sister-in-law was an artist, he commissioned her to make new wax figures. museum still advertises the addition to the collection. determined that a business district would be more useful. converted them into office space and a shoe store. thought we were an eyesore. Now it's a ghost town." Weekly. And it was there that the trail of the wax figures got warm again. night, it's real spooky," he said. "You have 40 wax figures looking at you. And they all look like Buddy Ebsen, whether they're male or female." fun of the South, or some of the positions these figures are in." chamber of horrors than a wax museum. covered with detached fingers. Uncle Dave Macon's gold teeth had been stolen. chest and a giant crack running along his neck. company, did not return phone calls. designer who created country high-fashion in the late 1940s. "This collection of suits is really the most complete I've ever seen,"
Medley said. "Their historical and monetary worth is considerable." are so exalted, and now their costumes end up on the floor." as they decay untended while Nashville races after its cosmopolitan dream.